Think about what the motivating, engaging, and well managed classroom truly looks like. What do you see? How do the students feel? What are you doing? and What are the students doing? I believe that there are elements of effective classroom management. Every teacher knows that students are always seeking attention; wanted or unwanted, and most of all the student has the need to feel safe. Every child seeks to find that comfort in where they spend most of their day. A child wants to know that not only are they physically safe but mentally too. “If a child doesn’t know how to behave, we……….. It is the job of a teacher to build up a child’s independence. They should grow to be able to do things without the direction of an adult all the time. I do not mean that you should be teaching them to raise themselves; I mean that you provide them with the knowledge to independently make their own decisions about what is right and how to complete simply tasks alone. The more independent a child is… the better classroom management is in your classroom. A teacher should always instill motivation and a love of learning in each student. If you tell a student that something is going to be boring but we need to bare it or get through it, they won’t. They will continue to take your word for it and consider it boring. If you spark their interest in something you are teaching they will listen and be engaged. From personal experience, students that are engaged DO NOT MISBEHAVE! You have to know, really know your students in order to know how to motivate them and drive them to enjoy learning as much as you love teaching. A classroom should have high expectations. I was lucky enough to listen to Ron Clark at a seminar in my county. Let me just say, brilliant. He told me that if you hold your students to a expectation that is not high they will meet it. Where’s the learning in that? If you hold them to a much higher expectation then that, guess what? They will most likely meet that too. Most classrooms have students of all abilities and levels of learning. If you have a high student in the beginning of the year but also very low students, you should not shot for only the lower students to meet the higher students. You should shot for all students in your class to meet a higher level then you brightest student. If you don’t, where is the student that came in high and leaves just the same? There was no rigor or higher learning for those students. All students deserve to be challenged. Ron Clark has proven that any student can do better if that is what you hold them accountable for. Which comes to my next point. A teacher must hold a student accountable. No matter the grade or age, children can understand rules and procedures if you teach them too. Now at different ages, you can only expect so much of a child; however this should not be an excuse. If you teach and re-teach, a child can be held accountable for their actions. This doesn’t necessarily mean unwanted behavior either, remember to always hold your students accountable for the fabulous work they do too! My last thought is that a teacher must be effective in his/her planning and delivering instruction. 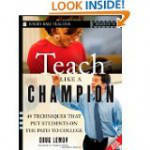 The book Teach Like A Champion says that a great strategy is to double plan. You should plan as if you have more time and plan thinking about how your students are going to re-act. If you know your students well enough you will be able to see what paths your teaching might steer them into. If you have two plans, you can come off course without it being a change of plans. You will also be more prepared for their responses. 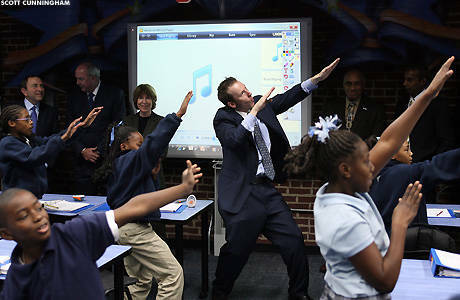 If you get a chance visit the Ron Clark website and read the book Teach like A Champion. Two great teacher resources, I couldn’t go without sharing.